Building the world’s tallest dam seems almost anachronistic in an age when the environmental and social costs of big dams are widely acknowledged. Yet Tajikistan this month launched the first turbine in its massive Roghun Dam. Many thought the project would never generate a kilowatt. For sure it has caused undeniable pain. The Tajik government for­­ced its citizens to buy shares; it sold bonds worth a fair chunk of GDP to foreign investors. Yet grumbling is muted, not just because the country is too authoritarian for public complaints. My experience researching Roghun’s predecessor suggests that many people associate the dam with a revival of Soviet-era development, or at least a rosy image of it, while the reasons Roghun was abandoned in the late 1980s are largely forgotten. Roghun has been nearly a century in the making. Back in the 1930s scientists first considered a series of large dams on the Vakhsh river, which has its source in the Pamirs and spills out into the Amu Darya. The idea was revived in the 1950s by a Tajikistani leadership eager to expand the republic’s electricity capacity and promote industrialization. The crown jewel of the “Vakhsh cascade” of dams, as planners called it, was to be the 300-meter Nurek Dam about 90 kilometers southeast of Dushanbe. By the time construction of Nurek properly got underway, many officials in Moscow, not least Nikita Khrushchev himself, had grown skeptical of large dams. But its boosters persisted, conducting new assessments and redrawing plans even as thousands of laborers crowded the worksite, sometimes with little to do. The project quickly took on a significance far beyond its immediate economic function. Proponents connected the dam to Lenin’s famous dictum that Communism = Soviet Power + Electrification. Nurek was supposed to put Central Asia finally on the road to socialism by bringing electric light to the most remote corners of the region. In fact, Nurek was not the original name of the dam. Planners referred to it as the “Dam at Tut-Kaul,” a village that was submerged. But it was eventually named after another local village, Norak. “Nor” means fruit in both Tajik and Uzbek; “ak” means white. Its rendering in Russian – Nurek – allowed a play on words, since “nur” means light in those languages. 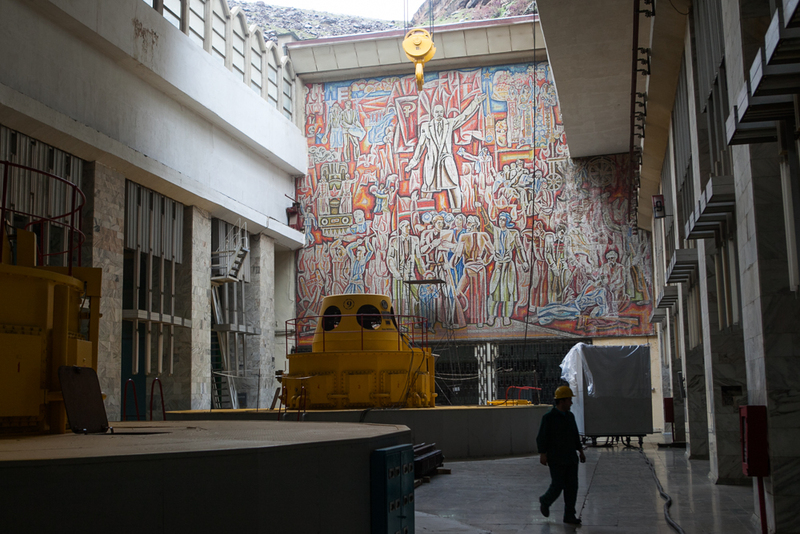 A piece of Soviet art celebrating industrial and scientific achievements hangs on the side of a mountain above Nurek. Nurek’s construction site itself became a testing ground for Soviet commitments to inter-ethnic friendship, equality, and social mobility. Like most dams, Nurek caused its share of displacement – in some cases pushing out people who had been forced to resettle for agricultural projects in decades prior. As Soviet officials began to tout Nurek as a model for the developing world, local managers were forced to take the needs of the population more seriously. Nurek’s construction brigades became involved in building schools, laying sewage and water pipes, and, of course, electrification. Managers were pushed to hire and train locals from surrounding villages, and to make a special effort to recruit women into the labor force. People I interviewed acknowledged the displacement caused by the dam, but they identified with the project and saw themselves empowered by taking part. Nurek’s long-term viability was always dependent on an even larger dam being built upstream. The Vakhsh is a big, powerful river. As it flows downhill it carries tons of silt with it. Foaming brownish water above the dam becomes a placid, bluish stream immediately downriver. Silt builds up over time. As the floor of the reservoir declines in capacity, so does the power of the dam itself. Without a larger dam – Roghun – Nurek itself would eventually become inoperable. Construction on Roghun got underway in the 1970s, after the first turbines at Nurek were already running but before the dam was complete. By then the enthusiasm of the post-Stalin years was running out; Soviet growth rates had stalled. 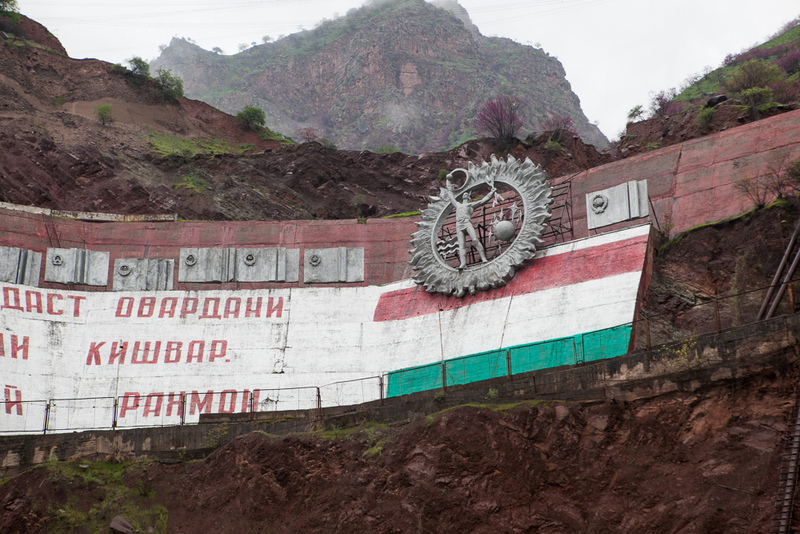 The new industries that had been built in the Tajik SSR – such as an aluminum smelter, now owned by Talco – did not seem to be paying the economic or social benefits foreseen in the 1950s. As a new environmental consciousness took hold in the 1980s, some of the same writers and poets who had once praised Nurek now turned against Roghun. Most famously, the poet Gulrukhsor Safiyeva, elected to the USSR Congress of People’s Deputies from Tajikistan, spoke passionately about how the dam would wash away the graves of her ancestors. Safiyeva’s protest did not stop Roghun, but it did give planners in Moscow a good excuse to suspend funding. By the late 1980s, the USSR was in trouble economically; Moscow was finding it difficult to balance the competing claims of the republics. The Central Asian republics were increasingly seen as an unjustified drag on the Soviet budget. Protests like Safiyeva’s provided an excuse. There were good environmental and social reasons to stop the project, though. Irrigation and hydropower schemes had caused the shrinking of the Aral Sea and contributed to the overuse of pesticides and chemical fertilizer in agriculture. What industry had been powered by Nurek and other dams downstream had seemingly done little to lift people out of poverty, but much to pollute the water and soil. It was clear by the late 1980s that Roghun was not going to get the kind of attention that Moscow had lavished on Nurek. Not long after the USSR fell apart, Tajikistan’s government, still embroiled in civil war, announced its intention to re-start Roghun. For all of the upheavals the country saw in the 1990s, few challenged the dam’s construction. The major opposition parties, so long as they still had a voice, did not speak against it. One has to look at the region’s experience after independence to make sense of this silence. The rapid drop in living standards in the 1990s, and the dependence on labor migration ever since, has left people desperate for a solution that keeps the lights on and provides jobs. My sense when I did research in the country between 2011 and 2015 was that people associated the Roghun project with Nurek – not as it really was, but the way it became mythologized: as a transformative project built by peoples from all over the USSR for the benefit of Tajiks. Yet hopes for Roghun are not a simple matter of nostalgia for the USSR. As with all development projects, it is an attempt to look forward, albeit one grounded in a selective memory of the receding past. Artemy M. Kalinovsky is Senior Lecturer in East European Studies at the University of Amsterdam and the author, most recently, of Laboratory of Socialist Development: Cold War Politics and Decolonization in Soviet Tajikistan.